Let the music madness begin! 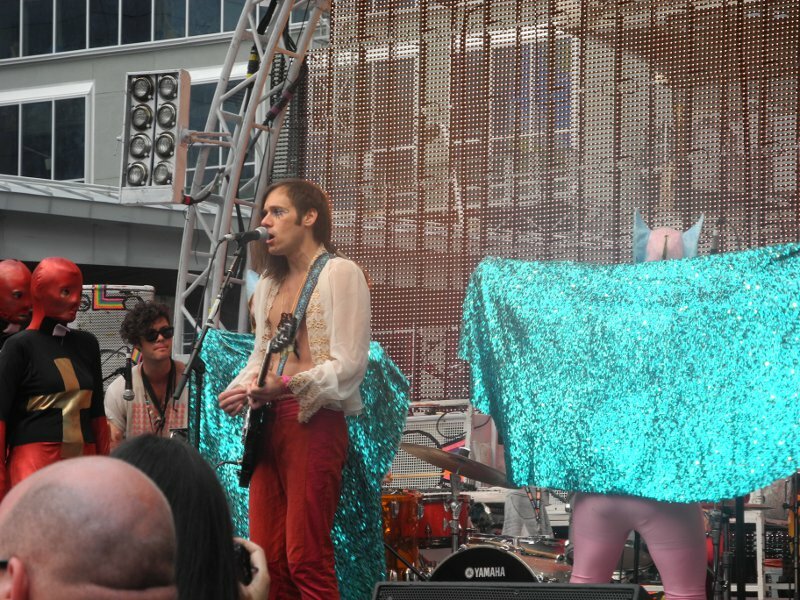 In this first of several posts (I saw 8 performances and endless scrolling makes people twitchy), I take a look at the raucous acts preceding headliner The Flaming Lips. Get out your moshy dancing shoes; these bands will make you move. Remember Zlad and his viral (fake) music video for his “Offblast” of a hit “Supersonik Elektronik”? 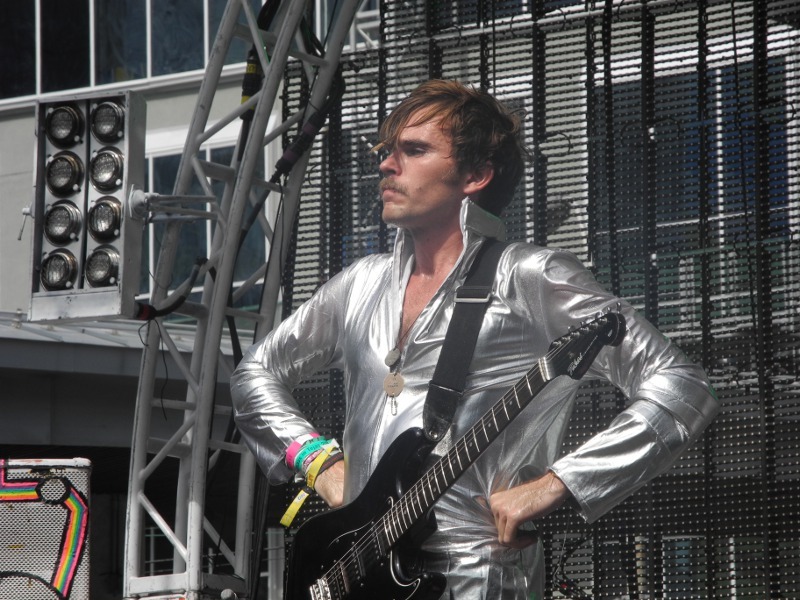 For those who don’t know their meme, Zlad is purportedly an alien sent to earth to seduce us in a silver jumpsuit. It’s one of my favourite viral videos of all time. Now, picture three men dressed like Zlad bursting onto a stage with sass. For a few brief moments, I wasn’t sure what to make of Art Vs. Science. Were they a shtick band? Was this their usual attire? Pretty soon, it didn’t matter. As the Australian trio kicked into gear, I was quickly won over by their dance-punk songs and incredible stage presence. The band’s sound reminded me immediately of that infectious Beastie Boys hit “Intergalactic” with a harder edge. Blending punk rock, dance and a dash of rap with a tremendous burst of showmanship, Art Vs. Science quickly won over the crowd, self included. With their playful call and response audience interaction and their Talking Heads meets Thomas Dolby lyrics, one can’t help but smile. For an 80s baby, their sound is pure heaven, although one often struggles with the decision to mosh or dance to the melodies, as both are suitable options. Doshy? Either way, the band delivered one of the most entertaining live shows of the week. Highly recommended. 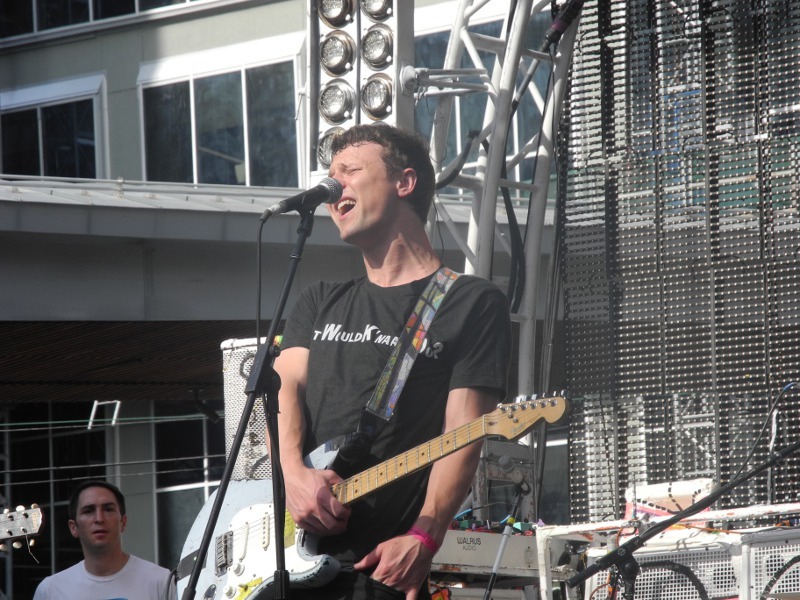 Although Ottawa’s Hollerado formed in 2007, it took until the 2011 Junos for them to get their new band nom. I could write an essay about how disappointing the Juno nominations and winners have been in recent years, but we’re here to talk music, not politics. Billed by many as indie rock, I’m more inclined to describe Hollerado’s sound as a joyous take on quintessential punk. With a heavy influence of the 70’s European punk scene and the ska punk of Rancid, Hollerado deliver a rocking good time peppered with stage banter and a little confetti canon for good measure. Their sound is tight and their passion for what they do is perfectly evident. It’s no wonder that they’ve endeared themselves to so many in Canada already. With music perfect for blasting out the windows of your car while cruising down a highway, Hollerado brings the fun without forgetting to be meaningful here and there. Thoroughly enjoyable and recommended! Next up in the tremendous line-up at Yonge Dundas Square was Brooklyn’s Oberhofer. Formed in 2008 and centred primarily around frontman Brad Oberhofer (who is charming and sweet to chat with), the band delivers an unusual yet highly enjoyable blend of rock/punk and surfer music – think The Clash blended with Misirlou. Punchy yet poppy guitars and smooth vocals come together in a light, airy tune. Vocals are gritty yet warm and inviting, the electronic feel a perfect complement for easy to relate to lyrics. Recommended. Confession time: I’ve never been on the Of Montreal bandwagon. I can’t quite articulate why precisely I’ve never become a fan – perhaps it is simply one of those things, like my minimal tolerance for and simultaneous respect of Bjork. In any case, I didn’t care much to see this band, as the studio cuts I’d heard did nothing for me. 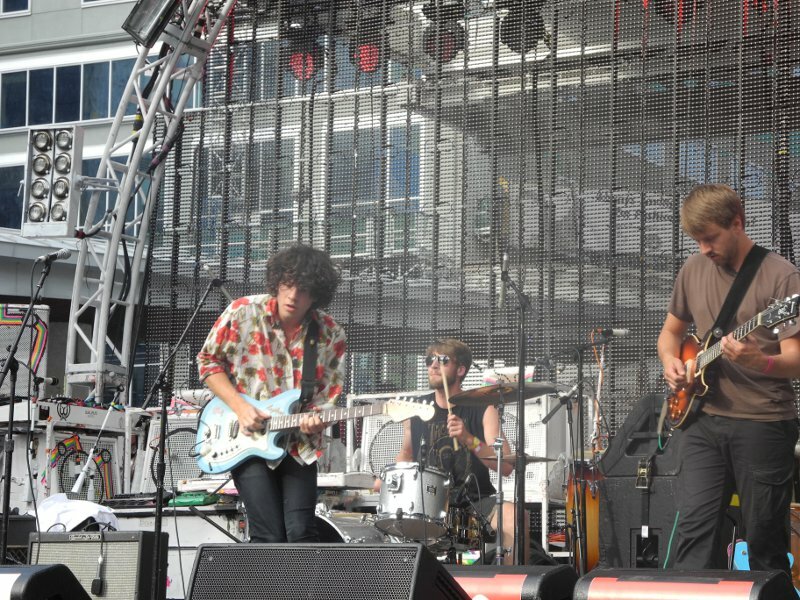 That said, I discovered that in their live incarnation, I enjoy Of Montreal. Best imagined as glam-punk-funk for the uninitiated, the stage show provided by the Athens, GA band is simply wild and unpredictable – kind of like their music. In its live form, framed by dancing creatures and projection displays, there is suddenly cohesion and sonically, it all makes sense. If you’re familiar with Marilyn Manson’s Golden Age of Grotesque era, you can appreciate the sort of Vaudeville-Gone-Wild impression I walked away with. Perhaps I may never purchase their CDs, but would I see them again? Absolutely. It’s an experience I recommend. Enjoy the blog? I also write novels in my spare time, heavily marinated in a love of music. Check out my work here!